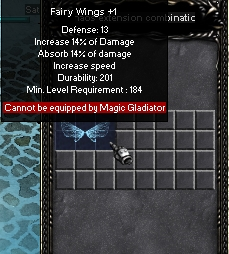 Small guide how to make first wings. 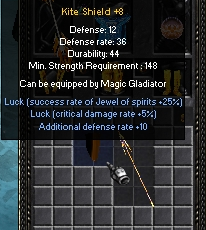 First u need get Normal items ( swords,armors,pants etc ) +7 +8 +9 or beter but obligate + option 4,8,12 or 16 Items u can get from Hert of Love ,medals,Box,Stars,Stack etc. 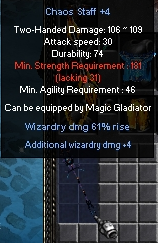 If u have Items go to Chaos Goblin. 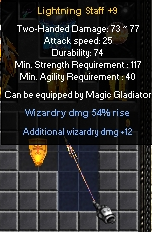 Then again u need Items +7+8+9+options + jawel of chaos + Chaos item ( staff,axe,bow ) +4 + option. 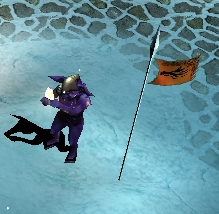 go again to chaos goblin. 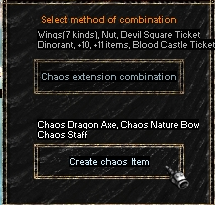 Put inside Chaos item + jawel of chaos + items +7+8+9 + options . p.s. 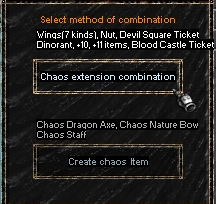 If option in item is biger then % in chaos machine beter.Never make wings with 50 or 60% Big risk.If have questions please post reply.